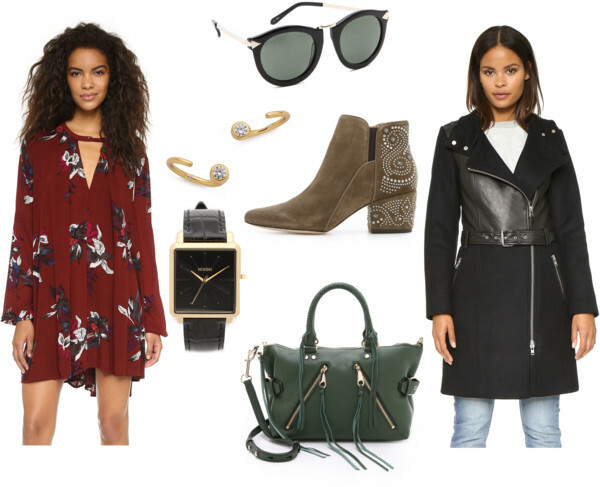 Shopbop's Friends & Family Sale! Hi friends! I'm back in the Wild West after an amazing vacation to Portugal and Spain. I can't even describe the amazing time we had there, it was well needed! I think I'm done with the jet lag (let's hope) and I'm so excited to share some new content on the blog from my travels. FREE PEOPLE: What's not to love about FP? Their easy going bohemian vibe is so great and I love how a lot of their dresses can easily be worn in all seasons with just a change in accessories. KAREN WALKER: KW sunglasses are a cult favourite with bloggers and fashionistas for good reason. They fit well and are well made. I have a tortoise pair that I'm always sporting on the blog and now I really want a black pair. SIGERSON MORRISON: I didn't know much about this fabulous brand until I saw fellow blogger Vickie from AiF sporting a black pair and I got hooked. Seriously, how amazing are those boots? I want them SO bad! REBECCA MINKOFF: I have quite the obsession with RM bags. Not only are they super cute but they are pretty affordable when it comes to a nice leather bag. The green satchel above was on my radar for a while and when the 25% off rolled around I jumped at the chance. 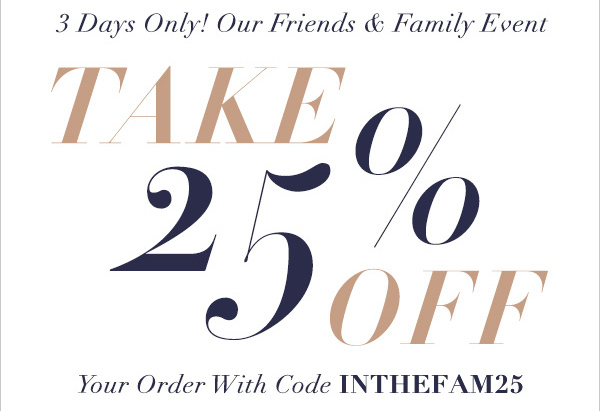 Remember to use code INTHEFAM25 at checkout! Happy Shopping! I have the Free People blouse (they say tunic/dress, but it's certainly not on me!) and I LOVE IT SO MUCH! I have it in a different color and get compliments on it constantly. I'm so tempted to buy this burgundy version but I'm not sure I need two... but I highly recommend if you are thinking about it! And love the RM bag you got! Beauty!